Two telehealth trials involving older people will commence in Armidale and Kiama (NSW) early next year. The projects are part of the Digital Regions Initiative and will be linked to the rollout of the National Broadband Network. The trials will focus on telehealth services for older Australians with chronic conditions, such as cardiovascular disease. Services available through the project include monitoring of wellbeing indicators such as blood pressure and glucose levels, home video consultations and healthy living coaching. The telehealth services will be delivered in collaboration with NSW Health, local GPs and primary care providers. Hunter New England Area Health Service’s aged care leader, Ian O’Dea Ian, welcomed the trial, saying it would help older people to remain in their own homes. “From my perspective…older people living at home will benefit enormously from telehealth to the home,” he said. The Minister for Broadband, Communications and the Digital Economy, Senator Stephen Conroy, said the trials would provide a number of advantages to older people in Armidale and Kiama. “Telehealth has many benefits including fewer presentations to hospital or emergency departments, a reduction in the number of visits to GPs and other health services, reduced travel times and transport costs and improved patient self-management,” he said. The federal government will carry out a comprehensive evaluation of the trials’ outcomes to explore how telehealth could be rolled out to more older Australians. The trials have also been welcomed by the Aged Care Industry IT Council (ACIITC). The group says telehealth and monitoring projects will provide enhanced care systems to older people living in their own homes. 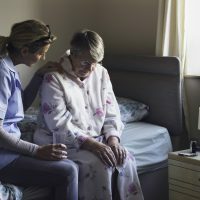 “Deployment of IT systems that improve care system efficiencies and workforce capacity is essential to meet the growth in the aged care population,” said spokesperson, Greg Mundy.